Description: Shot of the QF-106 aircraft in flight with the landing gear deployed. Description: In 1997 and 1998, the Dryden Flight Research Center at Edwards, California, supported and hosted a Kelly Space & Technology, Inc. project called Eclipse, which sought to demonstrate the feasibility of a reusable tow-launch vehicle concept. The project goal was to successfully tow, inflight, a modified QF-106 delta-wing aircraft with an Air Force C-141A transport aircraft. This would demonstrate the possibility of towing and launching an actual launch vehicle from behind a tow plane. Dryden was the responsible test organization and had flight safety responsibility for the Eclipse project. Dryden provided engineering, instrumentation, simulation, modification, maintenance, range support, and research pilots for the test program. The Air Force Flight Test Center (AFFTC), Edwards, California, supplied the C-141A transport aircraft and crew and configured the aircraft as needed for the tests. The AFFTC also provided the concept and detail design and analysis as well as hardware for the tow system and QF-106 modifications. 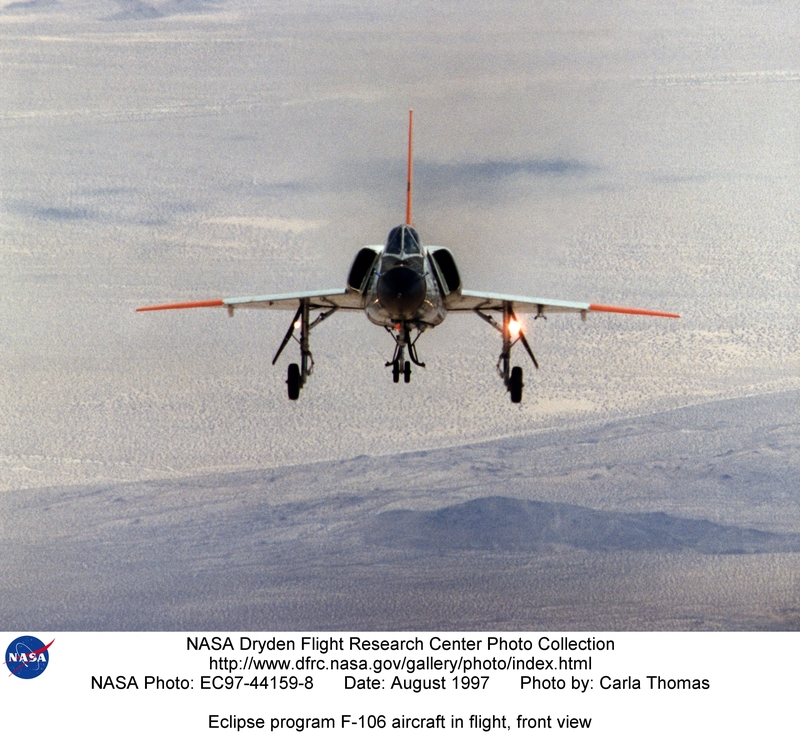 Dryden performed the modifications to convert the QF-106 drone into the piloted EXD-01 (Eclipse eXperimental Demonstrator–01) experimental aircraft. Kelly Space & Technology hoped to use the results gleaned from the tow test in developing a series of low-cost, reusable launch vehicles. These tests demonstrated the validity of towing a delta-wing aircraft having high wing loading, validated the tow simulation model, and demonstrated various operational procedures, such as ground processing of in-flight maneuvers and emergency abort scenarios. Keywords: Eclipse; C-141; Kelly Space & Technology; Inc.; U.S. Air Force; Dryden Flight Research Center; QF-106 delta-wing; EXD-01; Air Force Flight Test Center.